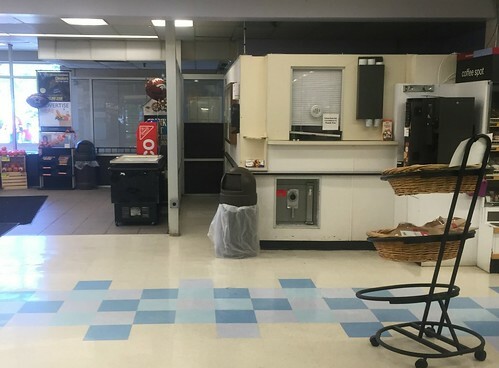 This week at P's and Q's we're taking a look at a Pathmark in Middlesex, New Jersey. This former ShopRite opened in the 70's, and was taken over by Pathmark most likely in the 90's. The emblem for ShopRite was most likely placed to the left of the building. This has to be one of the towns where the underdogs (Pathmark, Acme) stayed! 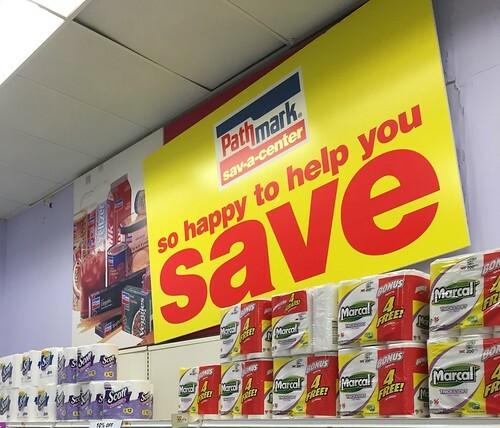 This store had the painfully generic Path To Savings / Save! decor. A "Coffee Spot" is up front... a new feature in Pathmarks. Paper towels along aisle 1. Blatant signage, too. 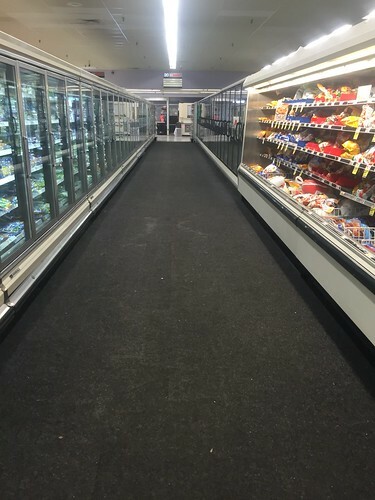 New-age aisle markers run perpendicular to the aisles in this store. Usually they would be mounted parallel. Old Super Center signage outside with some vents. This photo gives info of opening as ShopRite in 1968 and Pathmark in 1984. Kind of interesting as (depending on when in 1968 it opened) the Pathmark chain was part of Shoprite until 1968, when the Supermarkets General group broke away from Wakefern (ShopRite's cooperative) to form Pathmark! Very cool find, Will! Thanks for sharing. I had read that previous to writing my article. I had completely forgotten that Pathmark was part of Wakefern for the longest time. This store is scheduled to reopen as a Supermarkets Plus-owned Foodtown, but I don't know how successful they'll be given that the Elizabeth location (which was an IGA) closed after just over a year. This store is also more than double the size of the Elizabeth location. Wow, I didn't know that their Elizabeth location closed! Sad to see because the store looked like it was well-invested in. Time will tell what will enter at this location... for now, no plans are set in stone. Also, I found the article you were referencing with the news that Foodtown may enter, and it seems like it may be a similar situation to the Harvest Fare in Fallston, MD where half of the store is the supermarket (in this case, Foodtown), and the other is a hardware store (which is slated to be True Value at the moment). Yes, Fallston is exactly what I was thinking of! OK, this was a shock to me -- I just heard that Extra Supermarkets reopened the Supermarkets Plus Elizabeth location! That is not at all what I had expected, but Extra generally runs pretty good stores. Wow, congratulations to them! Glad they were able to save it. Hopefully they run it right!